The number of sessions currently connected to the server. 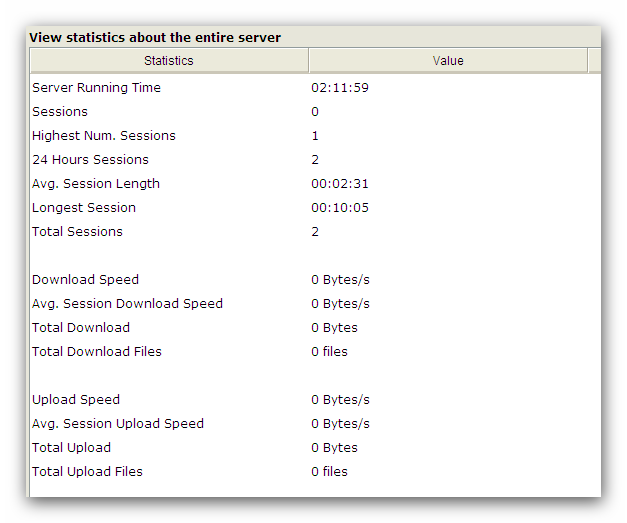 The highest number of concurrent sessions that has been recorded since being placed online. The number of sessions that have connected to the server in the past 24 hours. The average length of time that a session has remain connected. The longest recorded time of a session connection. The total number of sessions that have connected since being placed online. Cumulative download bandwidth currently being used. The average download bandwidth used since being placed online. The total amount of data downloaded since being placed online. The total number of files downloaded since being placed online. Cumulative upload bandwidth being currently being used. The average upload bandwidth used since being placed online. The total amount of data uploaded since being placed online. The total number of files uploaded since being placed online.